All Brick Rancher with an attached garage, multi-car driveway, and covered front porch sits on a beautifully landscaped 1/3 acre lot with a fenced rear yard, covered patio, and 2 storage sheds. The interior has been freshly and tastefully painted, the pristine gleaming hardwood floors have been refinished, and the Remodeled Kitchen with Stainless Steel Appliances is gorgeous. The finished lower level with its bath (plumbing is in place for a shower to complete the full bath) and kitchen has the potential to be a completely separate living quarters, a man cave or ladys place, or just a safe haven for the kids to play. For the summer months, the home has cool and refreshing central air, ceiling fans, and a thermostatically controlled attic exhaust fan and for the winter months it has warm and soothing gas heat all designed to keep costs low and you comfortable. There is lots of room for your clothes and belongings with generous bedroom closet space, several basement storage areas, a fully floored attic which has pull down stairs for access, and in the garage with its shelving and loft. The over sized garage has an automatic door, lots of electric outlets, water, and storage racks. 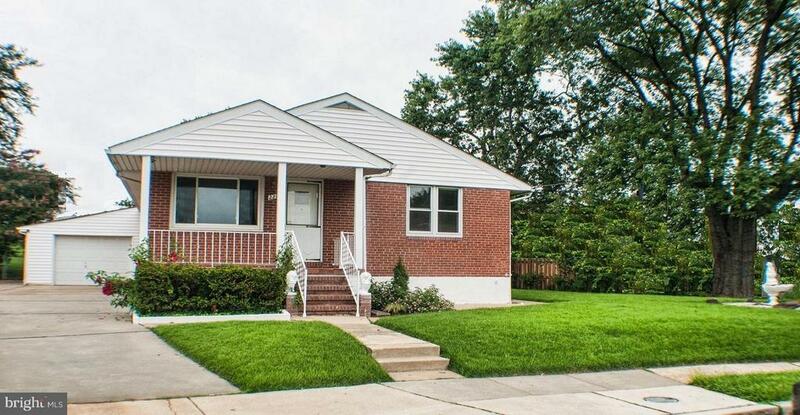 Accessibility is great with the Beltway only minutes away, Downtown Baltimore just a short commute, and numerous attractions nearby, all while the home sits at the end of a quiet cul de sac of well-maintained brick homes with nicely manicured grounds. This home is a winner from top to bottom.